When people think of gold mining in the United States, many conjure up a romanticized image of the California Gold Rush and a prospector panning for gold in a beautiful Sierra Nevada stream. Most of the gold currently being mined in the United States, however, was missed by the 19th century prospectors as they rushed across Nevada to get to California. More gold has been mined from Nevada in the last 40 years than was ever mined from California. Photo courtesy of the U.S. Geological Survey. The current gold boom in Nevada started in 1961 with the discovery of the Carlin gold mine, at a spot where the original prospectors missed the gold because it was too fine-grained to be readily seen. Most of the gold in Nevada, since the Carlin mine was put into production in 1965, has been mined from deposits within a 125-kilometer radius of the namesake town of Carlin. These “Carlin-type deposits” yield approximately 6 million ounces a year — about 8 percent of worldwide gold production. Almost halfway across the globe, river gravels in South Africa have yielded 40 percent of the gold ever mined on Earth. These gravels are similar to the ones panned during the California Gold Rush; however, they are 2.7 to 2.9 billion years old, having long since become part of the Witwatersrand Basin. They currently account for 17 percent of the world’s annual gold production and contain 46 percent of the world’s known gold reserves. Thus, quite incredibly, 25 percent of the world’s annual gold production comes from only two regions in the world with a combined area that is more than 120,000 square kilometers — a bit larger than the state of Ohio. Yet, equally remarkably, geologists lack a consensus on the origins of these gold deposits. High demand and correspondingly high gold prices make it increasingly important to understand the processes surrounding the genesis of gold in these two critical regions. New studies are revealing a complex set of earth processes that control the distribution of gold, while at the same time are lending insight into Earth’s early atmosphere and sedimentary basins. Most gold deposits in the world formed from hot fluids depositing gold as the temperature and chemistry of the fluids changed. If temperature and chemistry changed quickly and radically, then the fluids precipitated most of their gold in a small volume of rock at a sufficiently high concentration — or grade — that can be mined for a profit. Such gold deposits are commonly known as hydrothermal deposits or lode deposits. Active geothermal systems represent a modern-day analog of such deposits, and, indeed, some geothermal systems in Nevada, New Zealand and Japan are actively depositing gold. Once such hydrothermal deposits are exposed at the surface and begin to erode, fragmentary gold particles are carried away by streams. Because of gold’s high density (about seven times heavier than the average rock), it will preferentially deposit on the streambed due to a variety of “sorting processes,” such as decreases in stream velocities associated with bends and gravel bars. If the sorting processes are efficient in a restricted area and the gold particles are large enough, a “placer” gold deposit will form. The California ‘49ers made their initial fortunes mining placer gold deposits, mainly by panning stream gravels. In the Witwatersrand Basin of South Africa, however, the goldfields occur as bodies, known as reefs, which are typically centimeters to a few meters thick. Individual reefs can extend over several hundred square kilometers, typically with gold grades greater than 10 grams per ton, making the gold economically sensible to mine. The ore is produced from the deepest underground mines in the world, some of which extend to depths greater than 4 kilometers. Mining is labor intensive, with individual mines commonly employing more than 10,000 people. Despite the basin’s prolific gold production, however, the debate over the origin of its goldfields is sharply divided into two camps: the “placerists,” who believe the gold was transported by streams into the Witwatersrand Basin and then deposited in gravels, versus the “hydrothermalists,” who assert that hot fluids from deep within Earth infiltrated the Witwatersrand Basin along fractures and precipitated gold in the gravels long after they had formed into conglomerate. Debate over a hydrothermal versus placer origin for the Witwatersrand goldfields led Charles Davidson in 1965 to call the controversy “the most disputed issue in the history of economic geology.” By the 1970s, placer models predominated, mainly because of proven successes in applying sedimentology to locating ore. But the 1980s saw a resurgence of the hydrothermal model, brought on by outside researchers and in-house research by some of the large mining houses, such as Anglo American. Today, the debate continues, as evidenced at a special meeting last year of the Society of Economic Geologists (SEG) that explored the controversy surrounding the origins of the Witwatersrand goldfields and the Carlin-type gold deposits of Nevada. There, the leading proponents of each view reviewed two decades’ worth of major research efforts on the Witwatersrand, which have brought to light huge amounts of new data. In recent years, the placer view has evolved into a more sophisticated “modified placer” model. Most placer model supporters agree that most of the gold is concentrated in fractures rather than as sedimentary particles; however, they argue that gold was originally loose material and was then remobilized and redeposited short distances (microns to a few meters at most) from its original site by fluids that infiltrated the basin after other sediments had stopped depositing. This open-pit gold mine in Nevada is one of many in the Carlin region, from which 8 percent of the world’s gold is mined. Photo courtesy of Steve Garwin. To better tease out these arguments, many geologists have turned to the shape and textures of the Witwatersrand gold and its associated minerals. The placer camp still maintains that because at least some of the gold and associated pyrite and uraninite have rounded shapes, they were deposited by streams. The main proponent for the placer model at the SEG forum, Hartwig Frimmel of the University of Würzburg in Germany, presented images of gold from the Witwatersrand with shapes very similar to those panned in modern-day streams or found in modern wind-transported placer gold. Frimmel’s colleague Lawrie Minter of the University of Capetown in South Africa has described these images as “irrefutable” evidence of the placer origin of Witwatersrand gold. However, as Davidson did in 1965, hydrothermalists caution not to confuse sedimentary origin with sedimentary control on gold. The main protagonists for the hydrothermal model at the SEG meeting, Neil Phillips and Jonathan Law of CSIRO in Australia argued that the rounded nature of the pyrite is the direct result of replacement of pre-existing iron-titanium oxides and other iron-bearing minerals of placer origin in the conglomerates. Such replacement is known as sulfidation. Most economic geologists agree that hydrothermal fluids transport gold in dissolved sulfide molecules. If sulfur is removed from the hydrothermal fluid as a result of reaction with iron in the rock and forms pyrite, the gold-sulfur molecules will destabilize, causing gold to precipitate out. Therefore, gold is commonly associated with pyrite in hydrothermal gold deposits. Although uncommon, minerals that are partially replaced by pyrite have been observed in the Witwatersrand goldfields, supporting Phillips’ and Law’s sulfidation hypothesis. Clearly, the textures of the minerals are equivocal and have not provided any “smoking guns.” Instead, many geologists consider recent age dates that demonstrate the gold is older than the Witwatersrand Basin the unequivocal smoking gun. In a paper published in Science in 2002, Jason Kirk and colleagues from the University of Arizona in Tucson used rhenium-osmium isotopic dating techniques to date gold in a Witwatersand reef as 3.016 billion years old — significantly older than the host rocks. They also dated rounded pyrite from the reef to 2.99 billion years old — still clearly older than the conglomerate rocks (between 2.7 billion and 2.9 billion years old). They suggest the source of the gold to be gold-enriched mantle-derived rocks that are found outside the basin. The fact that both the gold and pyrite are older than when the basin formed strongly supports the idea that rivers carried the gold there in loose sediments. Still, although the rhenium-osmium data may appear to be a smoking gun, one date from one sample of gold from one reef should not put an end to the debate. Carlin-type deposits in Nevada occur as clusters along parallel lines — the Carlin trend being the most famous. 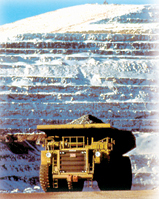 Ore with gold grades of typically 1 to 5 grams per ton has been mined primarily from large open pits that can extend 3 kilometers across and 500 meters in depth. Each year, a larger proportion of the production comes from higher grade ores (greater than 7 to 10 grams per ton) mined from underground. Carlin-type deposits occur in “dirty” carbonate rocks that are hydrothermal in origin. Hot acidic fluids dissolved away much of the carbonate, turned the rock essentially into a sponge, and introduced silica, sulfur, gold and a whole host of trace elements. The carbonate rocks that host the Carlin-type ores are commonly carbon-rich, and the first impression of many visitors is that the large open pits look more like coal mines than gold mines. In unweathered ores, the gold is submicron in size and occurs in trace-element-rich pyrite. The extremely fine-grained nature of the ores has hampered studies aimed at understanding their genesis. In addition, Nevada has experienced a complex geologic history with multiple hydrothermal events that occurred prior and subsequent to formation of the Carlin-type deposits. Because of these difficulties, a consensus on the age of the deposits has only been arrived at in the last decade. Most geologists now agree that the deposits formed during a narrow time interval in the Eocene between 42 million and 36 million years ago, when Nevada’s continental crust began to thin during a time of renewed magmatism. Controversy over Carlin-type deposits centers around the source of the gold-bearing hydrothermal fluids — how the fluids traveled to the deposit sites and then deposited their gold. The battle lines at the SEG forum were drawn between “flushers” and “magmatists.” The views of these two camps mirror the debates in the 1700s between Neptunists and Plutonists, who argued whether rocks formed from primeval oceans or magmas. Flushers maintain that groundwater percolating down leached gold out of rocks in the upper part of Earth’s crust. Heated by renewed magmatism in the Eocene, the groundwater began its return ascent in large convection cells and deposited the gold within a few kilometers of the surface. Much of the early oxygen and hydrogen isotope data from Carlin-type deposits are consistent with quartz and clays having formed from groundwater, supporting the flushers’ position. However, recent analyses using an ion probe with a sampling size of 10 to 20 microns have greatly improved understanding of the fine-grained Carlin ores. In such analyses, samples of quartz, clay and pyrite have shown oxygen, hydrogen and sulfur isotope signatures that are consistent with water and sulfur sourced from magmas. These data have the magmatists licking their chops. The main magmatists at the SEG forum, Marcus Johnston and Mike Ressel, who are exploration geologists for Victoria Resources and Newmont Mining, respectively, argued that much of the gold, as well as water and sulfur, responsible for Carlin-type deposits was exsolved in a fluid — like bubbles in a champagne bottle — from crystallizing magma bodies in the upper parts of Earth’s crust. They suggested that this hydrothermal fluid then variably mixed with local convecting groundwater, and deposited gold in the carbonate country rocks within a few kilometers of the magma intrusions. Eric Seedorff and Mark Barton of the University of Arizona argued against a magmatic origin. Ironically, Seedorff and Barton have spent much of their careers exploring for or studying types of hydrothermal ore deposits that everyone agrees are related to magma intrusions. They showed that the surface areas of hydrothermally altered rocks associated with some of the largest intrusion-related copper-gold deposits in the world are dwarfed by the areas associated with Carlin-type deposits. They particularly noted that there was none of the “signature zonation” of minerals related to temperature usually found around magma intrusions. There is an old saying that “gold is where you find it.” However, mining companies do not spend hundreds of millions of dollars annually exploring for gold hoping to simply stumble into deposits. Models for gold deposits thus play an important role in how mining companies explore for gold, whether they admit it or not. For example, should a company spend millions of dollars exploring for Carlin-type deposits outside Nevada? A company with strong magmatist leanings might believe that seeking evidence of gold-bearing hydrothermal systems associated with intrusions emplaced into carbonate rocks anywhere in the world will lead them to the next Carlin trend. Other companies might consider Carlin-type deposits as unique products of the geologic history of Nevada and, therefore, will continue to explore for them only in Nevada. Likewise, is there another Witwater-srand? Discovery of another such basin would lead to hundreds of billions of dollars of wealth. 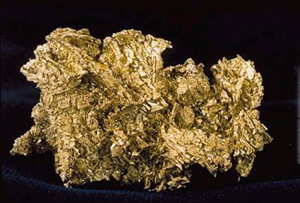 On the one hand, the huge goldfields of the Witwatersrand could be the result of a unique set of circumstances, whereby a preserved ancient basin contains gold that was eroded from gold-rich, mantle-derived rocks. But on the other hand, hydrothermalists maintain that the goldfields reflect earth processes that have been operating throughout geologic time and, therefore, that similar deposits will be found elsewhere. Will companies take that gamble? Gold exploration always has been the essence of risk and reward. On top of its economic implications, analyzing the mineralogy of the Witwatersrand goldfields serves another purpose — revealing the composition of Earth’s early atmosphere. Because the Witwatersrand gold formed during the Archean some 3 billion years ago, looking at the associated minerals can tell scientists about the environment in which they formed. Since the early 1950s, many geoscientists have argued that the Archean atmosphere lacked oxygen because uraninite and pyrite could not have survived transport by stream processes with oxygen present. Like everything else in this quest for understanding, the jury is still out on that early Earth hypothesis. Only more exploration will lead to that golden knowledge. Muntean has spent the last 22 years exploring for or studying gold deposits. He is currently a research economic geologist with the Nevada Bureau of Mines and Geology at the University of Nevada in Reno.